This year's design at the Sandy River Farms corn maze. FARMINGTON - Roughly 4,500 visitors from throughout the region will be stopping at the Corn Maze on Route 2 this month, according to Sandy River Farm's owner Bussie York. 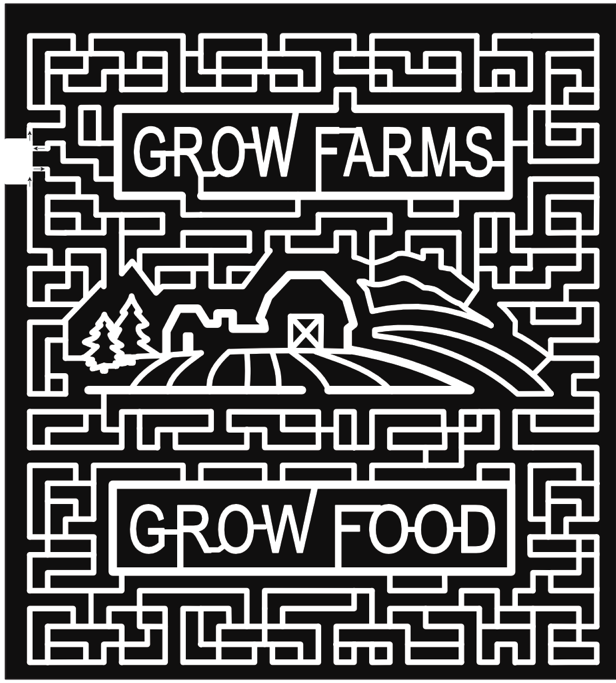 This is the ninth year the farm has hosted the maze- a sprawling 12 acres of 40,000 corn stalks dissected into intricate twists and turns. Each spring the corn is planted into rows and grown to an immature height before the design is hand painted in the field. The painters work on a grid system to get the design accurate followed by an application of crop retardant to clear the path. Before the maze opens to the public in late September, the path is smoothed by a rototiller. The entire process is done on the ground, without the use of any aerial assistance, by a company from Utah who York said cuts roughly 300 designs country-wide each year. This year's design is the Maine Farmland Trust logo: a barn sitting in a field with a scattering of trees, bordered by the words 'Grow farms, grow food'. The organization works to promote and protect the work of farmers throughout the state by connecting them to resources, protecting farmland and educating the public on the importance of agriculture. Each year the Yorks choose a different agricultural-related organization or business to promote with their maze. 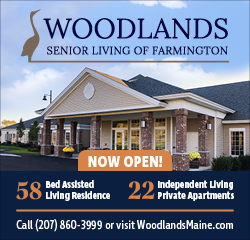 Past organizations have included the 4-H club, United Farmer Veterans of America, the University of Maine at Farmington, and Sandy River's own design to celebrate their 60th anniversary. Sandy River Farms has had a difficult year after losing a contract with Horizon Organic back in February. York said the company didn't want the family to sell locally, despite their farm store having been open for seven years. "We could have closed the store, but we had already developed quite a clientele here and we thought we would be a traitor if we didn’t continue doing what we had started," York said. So the 80-year-old farmer let go of the contract, opting instead to focus on boosting local sales. The family-run business has been working hard all summer to promote the sales of their homemade ice cream, yogurt and butter that is sold at their farm store as well as at a handful of local businesses such as Tranten's Market. "The situation is stressed nation wide. We've looked under every rock there is. Now we're just trying to gain more customers and develop the recognition and significance as Sandy River Dairy," he said. Despite an outpouring of community support through sales, the Yorks are still struggling. A development of one of the state's largest solar power facilities on York's land is one way to ease the difficulties ahead, but the business is far from where they need to be York said. The family has been trying to become a supplier for places like UMF and Franklin Memorial Hospital, but it's difficult, according to York, to break into those set ups. "We just keep trying all the time," he said. That is one cool looking maze!! What dates and times will the maze be open? The products they sell at the store are excellent! Everyone should try their ginger ice cream! I love the farm store. I buy my milk, hamburger and sausage there. Great products and nice people. I'm hoping that the store is able to stay afloat and that they will be bringing back glass bottles! "Grow Farms, Grow Food" An odd message from someone about to convert all that farmland into a solar farm. doncha think? hold the phone your on the money, just follow it and that's what it's ALL about. WHO/WHAT are you going to blame?? Bussy and Brenda never gave up the fight; they are simply doing what is necessary to keep the land in the family. I have known them all my life in one way or another; I love them and wish them well!